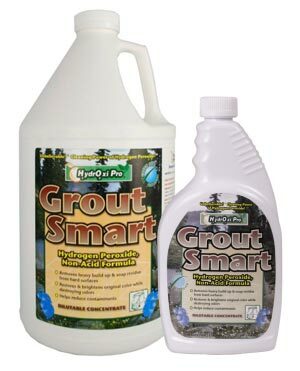 HydrOxi Pro Grout Smart is a unique concentrated solution of natural orange oil, hydrogen peroxide and surfactant technology that safely renovates, cleans and maintains hard surfaces. Restores and brightens tile and grout, brick and natural stone to its original color. Helps reduce contaminates including mold and mildew. Once the surface has been renovated, Grout Smart may be diluted to a light solution for daily cleaning. Also for use in auto-scrubbers, steamers, pressure sprayers and extraction machines. Easily removes heavy build up of soap residues from hard surfaces. Helps reduce contaminates. Restores and brightens original color while destroying odors. For use on: Windows, mirrors, walls, all types of floors, toilet bowls, shower rooms, tile & grout & kitchens. Restores and brightens tile & grout, brick, stone and marble to its original color. Helps reduce contaminates with the power of hydrogen peroxide. Once the hard surfaces have been renovated, Grout Smart™ may be diluted to a light solution for daily cleaning. Establishing a maintenance program maximizes chemical use and reduces time in each work station, saving you money. Grout Smart™ can also be used as a versatile cleaner/degreaser. The natural orange oil breaks down grease, grime and dirt, while hydrogen peroxide destroys any organic odor that is present. May also be used as a general spray and wipe cleaner for bathroom surfaces, kitchen surfaces, desk-tops and stainless steel.